Fortnite fans will be aware of a huge purple cube making its way slowly across the battle royale’s map. 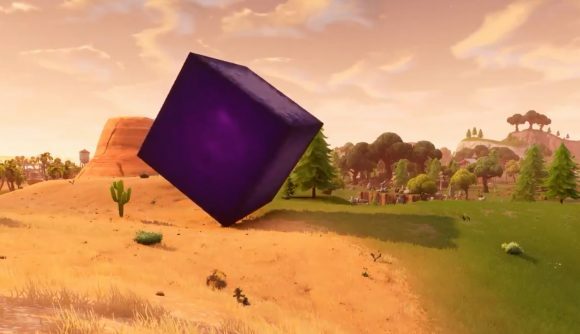 The cube, which appeared last week, turns over roughly every 1.5 hours, and is plotting a course likely related to the theme of the game’s upcoming sixth season. Unsurprisingly, people have been trying to break into said enormous purple shape more or less since it arrived. Yesterday, somebody succeeded for the first time. Sadly, the result was somewhat disappointing, if not particularly surprising. The cube is empty, as barren inside as the desert it landed in, offering no clue as to what its purpose in the game might be, or what it’ll do when it reaches its destination. Reddit user Gsonicfy made their way into the cube over the weekend. In their Reddit post, they say “it looked like my friend bumped into me right as I was bouncing up. Somehow this fucked up the Cube’s physics and it let me pass through.” Sadly, there wasn’t much opportunity to explore once inside thanks to the oncoming storm. That said, there really wasn’t much to see. As you can see from the video below, the cube is entirely empty. As I mentioned earlier, that’s not very surprising, as Epic clearly didn’t expect anyone to make their way into the Cube, so there was little reason to put anything in there for anyone to find. If you’d like to try and make your own way inside the cube, you might find you struggle. Gsonicfy and their pals were all in Playground mode when they did so, so that might help, but this does seem to be one small and difficult-to-repeat exploit in a very specific spot. You might be better off just waiting for the cube to reach its destination (wherever that may be). On that subject, check out the Fortnite week 7 challenges – we’re not all that far away from Season 6, so you’re running out of time to earn yourself that Ragnarok skin.